This is chamber music with a colourful fusion twist: chamber ensembles of VICO musicians performing repertoire that weaves together many different world music traditions, including the world premieres of new pieces by emerging Canadian composers (developed through the VICO’s 2017-18 Sounds Global Composers’ Workshop). Featuring: Yun Song (erhu), Saina Khaledi (santur), Navid Goldrick (oud), Sarah Kwok (viola), Milan Milosevic (clarinet/tárogatò) and Finn Manniche (cello). This is chamber music with a colourful fusion twist: chamber ensembles of VICO musicians performing repertoire that weaves together many different world music traditions, including the world premieres of new pieces by emerging Canadian composers (developed through the VICO’s 2017-18 Sounds Global Composers’ Workshop). Featuring: Yun Song (erhu), Saina Khaledi (santur), and Finn Manniche (cello). 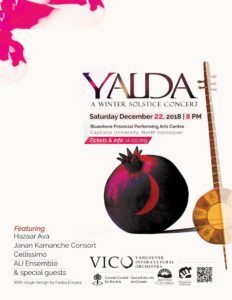 This is chamber music with a colourful fusion twist: chamber ensembles of VICO musicians performing repertoire that weaves together many different world music traditions, including the world premieres of new pieces by emerging Canadian composers (developed through the VICO’s 2017-18 Sounds Global Composers’ Workshop). Featuring: Yun Song (erhu), Saina Khaledi (santur), Navid Goldrick (oud), Sarah Kwok (viola), and Finn Manniche (cello). Our 2017-2018 season draws to a close with these two concerts, which are the culmination of our 2018 Summer Academy, a week-long intensive for composers and musicians on the creation and performance of intercultural music. On Saturday July 28 at 8 pm, a chamber ensemble of VICO musicians will perform music by Mark Armanini, Moshe Denburg, Amir Eslami, Farshid Samandari, and visiting artist Erica Roozendahl (The Netherlands). On Sunday July 29 at 3 pm, the ensemble will premiere new works by emerging composers, developed during the week-long intensive. Featuring: Erica Roozendahl (accordion), Jonathan Bernard (percussion), Mike Brown (clarinet, bass clarinet), Rosanna Chiu (harp), Hamin Honari (tombak), Saina Khaledi (santur), Finn Manniche (cello), Behzad Mirloo (kamanche), Eliza Thorn (harp), Lan Tung (erhu); Academy leaders Mark Armanini, Farshid Samandari, and Moshe Denburg; and Academy participants. The VICO is hitting the road! In September, for the first time in our 17-year history, we are taking the full orchestra on tour. We are excited to be making our US debut at the invitation of Glacier Symphony Orchestra & Chorale in Kalispell, Montana; we will then travel to Winnipeg, Manitoba for our first ever Prairie appearance, hosted by Groundswell. Under the direction of guest conductor John Zoltek, the 21-piece VICO will perform new and recent compositions by Lan Tung, Jennifer Butler, Farshid Samandari, Niel Golden, Jim Hiscott, Mark Armanini and others. We look forward to sharing the VICO’s unique brand of contemporary Canadian “orchestral intercultural fusion” with new audiences this fall. We are proud to present Canadian artists, Canadian music and a uniquely Canadian approach to diversity in art, both nationally and internationally. In this special Winter Solstice edition of our free public educational series, the VICO presents an introduction to traditional Persian instruments, featuring Amir Eslami (ney), Behzad Mirloo (kamanche) and Farshid Samandari (composer). This evening is an opportunity to get up close and personal with the process of creating and performing intercultural music. Guaranteed to broaden your horizons! The VICO is proud to present an evocative, contemplative evening of chamber music for voice and intercultural strings, bringing light and warmth to the longest night of the year. Tickets are on sale now!